Fred Corder and Agnes Paras: Cooking to ease his homesickness. It is chicken the way his grandma would make it: fresh, fried, with no MSG or extenders. 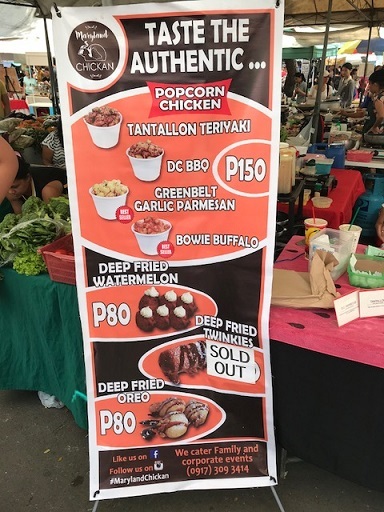 The name alone makes Filipinos, strolling by Legazpi Sunday Market in Makati City, take a second look. It’s chicken with an A, the way Maryland folks would pronounce it. “Most people around the world are familiar with the Texas accent and its linguistic opposite, the New York accent. But Maryland is a border state. We are not from the South or from the North. So it gives us a funny in-between accent — the casual substitution of E with A,” he explained with a hint of chuckle in his tone. In operation since May 2016, Maryland Chickan’s main specialty is no doubt their “Popcorn Chicken,” which as their very title implies are popcorn-sized fried chicken nuggets served with fried rice in a big cup bowl. My appetite beckoned me to sample the “Greenbelt Garlic Parmesan”-flavored popcorn chicken bowl, which to the delight of my taste buds, possesses a rich garlic and parmesan cheese-marinated zest. Other popcorn chicken flavors on the menu were the “Tantallon Teriyaki,” “DC BBQ,” “and the “Bowie Buffalo.” Just as I was in the mood for desserts, Fred offered me the “Deep Fried Oreo,” which after displaying to me his expertise in drizzling the fried products with chocolate syrup. A comic book writer, Fred’s entry into the fast-food business may have started when he was a young boy growing up in the Old Line State, but little did he realize it then. “I think it started out as a grandma cooking for her grandson,” he said. Maryland Chickan are the meals his grandmother had cooked for him growing up in an African-American family of more than 12 people. His grandmother would “spice things up” with their chicken dishes to avoid monotony. 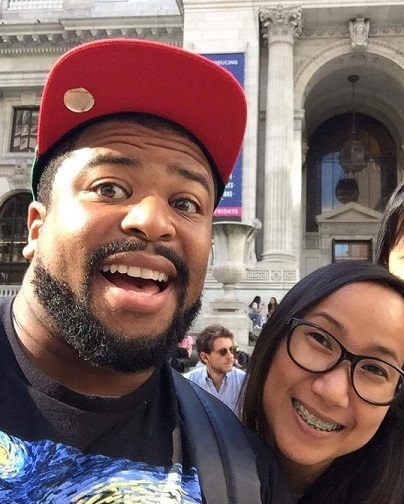 Fred’s business partner is his girlfriend Agnes Paras. A native of Dasmariñas, Cavite, She stressed that while they serve an all-American dish, they make sure their offerings are “culturally mindful” of the local appetite. For example, chicken meals are served over two cups of rice instead of biscuits. 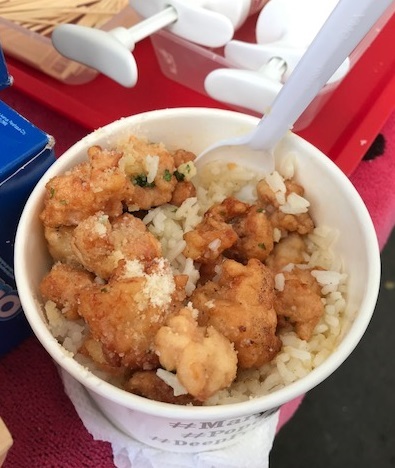 “Instead of chicken strips, we opted for the American popcorn chicken cuts because we Filipinos like bite-size chicken and rice,” she said. Fred serves author his Deep Fried Watermelon. The couple decided to go into the food business when Fred began to start feeling homesick being too far from home. Agnes ‘researched’ the Fred’s favorite comfort food. 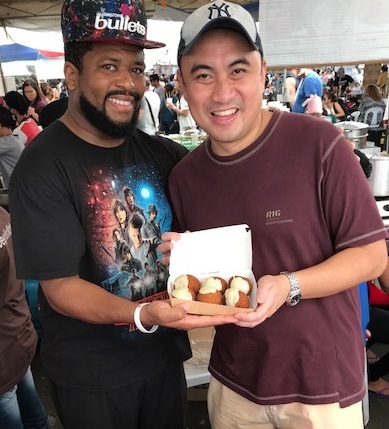 Fred and Agnes have frequented other food markets in Manila, although they find the Legazpi Sunday Market to be the most suitable location for Maryland Chickan. As their business continues to grow, they plan to participate in events outside Luzon and Asia. For now, they enjoy the excitement which their “pop-up shop business model” service provides to its customers. Maryland Chickan can be reached at marylandchickan@gmail.com.